Despite busy schedules, the five co-leaders of Opus 5 return once again with a fourth album, Tickle, a statement of great virtuosity, melodic integrity and rhythmic focus. Taking its place alongside Introducing Opus 5 (Criss 1339), Pentasonic (Criss 1351) and Progression (Criss 1369), this session finds the band in peak form, interpreting compositions by all the band's members. 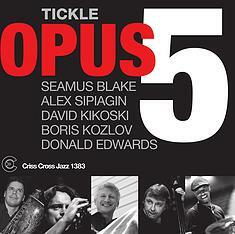 From the shifting funk-to-swing of drummer Donald Edwards-penned title track, to the singable purity of tenorist Seamus Blake's opening Silver Pockets , to the poetic bass cadenza and plaintive mood of bassist Boris Kozlov's closing ballad Murzake , Tickle secures Opus 5's place as one of the most compelling and long-lived collectives in recent years. Pianist David Kikoski composed the beautiful New Old Ballad , trumpeter Alex Sipiagin wrote Equilibrium .